Does the Pentel Finito! really exist? They obviously do, I have three of them in the picture right up there. But if I wanted to link to them online for more information or even a place to buy them, that is a bit more difficult. I bought mine at Staples a month or so ago, but they are nowhere to be found on their website. No problem, Pentel will certainly have some info on their website. Or not. I gave up looking eventually. Sure, there are ebay listings, and out of stock Amazon links, but I have already wasted more time than this pen deserves. It is not a terrible pen but it doesn’t fit my writing style. The ink flow is massive. So fast that I can barely stay out in front of the bleeding. Extra Fine it is not. It does look the part though. The barrel is nice and sturdy and the tip is well designed, but compared to similar pens like the Sharpie Pen the Finito! doesn’t even come close performance wise. This is more of a marker pen than a writing or drawing pen, so adjust your expectations accordingly. That is if you can actually find a place to buy them. 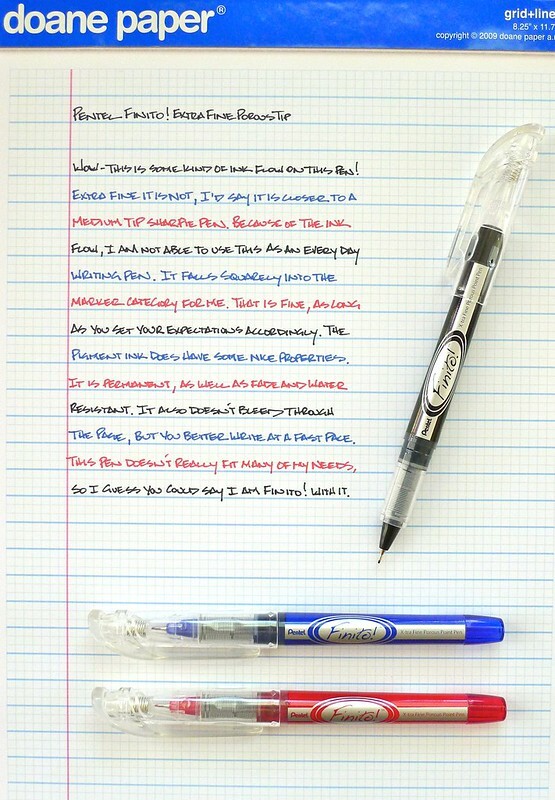 Posted on July 25, 2012 by Brad Dowdy and filed under Finito, Pen Reviews, Pentel.